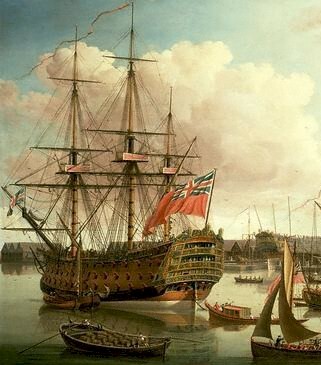 Named after HMS Royal George which sank in Portsmouth harbour in 1782. The ship was purposely listed to one side to raise the opposite side above the water line for repair. Cannons were carefully placed to keep the balance whilst a supply vessel, 'The Lark', approached on her low side and began transferring goods and crew aboard. The ship started to listed enough allowing water to enter the gun ports which were thought to have been left unsecured. 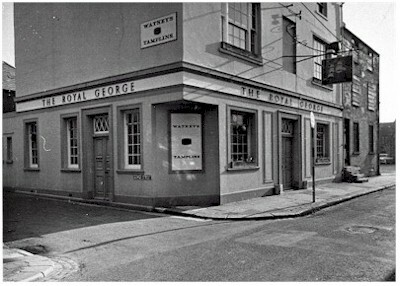 The Royal George rolled and sank taking some 600 people (including women and children) to their deaths. 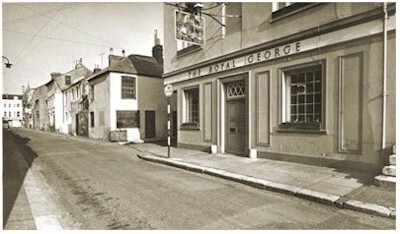 The original pub sign depicted before and after scenes of the event. George Greenfield took over the pub and later built (in 1935) the Egremont Hotel and brewery.